Allan Block Cobble Hill | Central Landscape Supplies Ltd.
Central Landscape Supplies has been a supplier of Allan Block in Cobble Hill for over two decades. Allan Block is a product we don't just sell, but we understand the product and everything you can use it for. We feel it is important that our customers are able to view the many options available to them in order to get exactly what they need. Allan Blocks are readily available in a variety of sizes and finishes to meet your aesthetic needs and appropriate structural performance. Blocks can be used individually or blended together to create textured patterns with a natural stone appearance. The outdoor enthusiasts will be satisfied enjoying the beautiful projects they can build in just a weekend. Beautify your yard with above or below ground ponds, garden benches to accent the special corner, or create the greatest barbecue grilling station and outdoor bar in the neighbourhood. 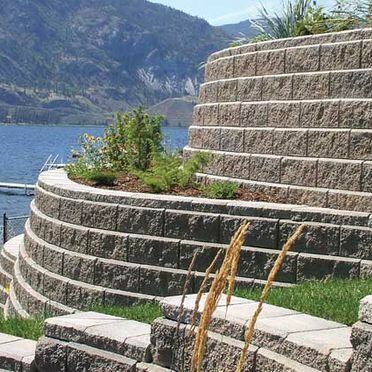 Allan Block walls do not require a foundation, but when building retaining walls, the key to completing a successful project is all in the preparation of your base. With a solid, well prepared base, the blocks lock together without pins, metal clips, or mortar. They stack easily and are engineered to deliver a high-strength concrete wall that will not rot like timber. The aesthetically pleasing finished wall will last forever and, if constructed properly, will add tremendous value to your home. For great ideas to spark your creative interest, we encourage you to visit the International Allan Block website. Their website has inspirational photos for creating retaining walls, custom courtyards, and outstanding fences. Their video section provides step-by-step instructions to plan and design using the Allan Block product. 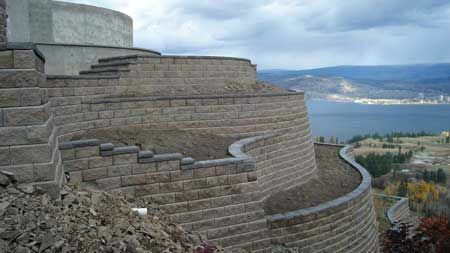 For an eco-friendly and long-lasting retaining wall, curb, or courtyard, Allan Block is a must. Contact us today to talk to our experienced staff about installing Allan Blocks in your garden.